This lease deed is the contract made for leasing or renting of commercial property. Lease deed is a legal document which is framed out to chart down terms and conditions under which the property is leased out. 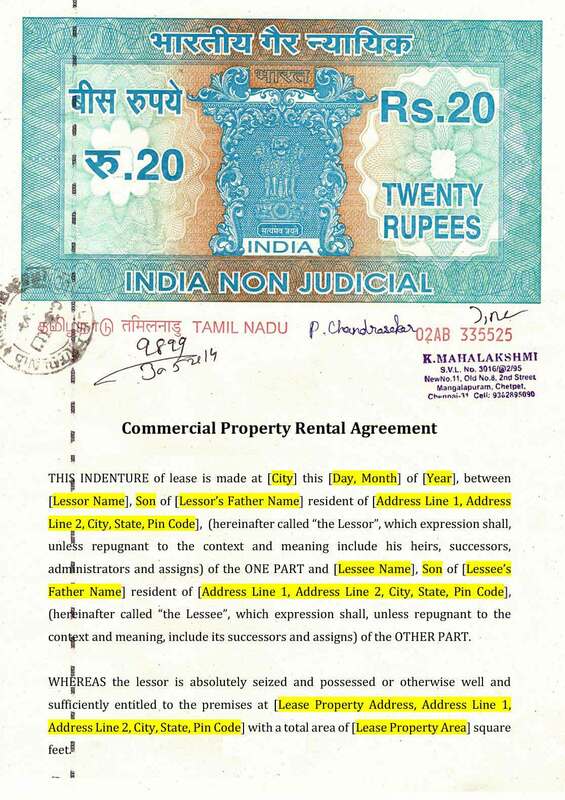 Lease deed must contain information about the lessor( the absolute owner of the property ), lessee(the person acquiring the rights to use the property on lease), tenure of lease(the term for or period for which the rights to use), lease payments payable and other important terms to be followed by both the parties during the lease term. In spite of the fact that the connection between the landlord and the occupant is sincere more often, it is good to have a written document that defines the legal relationship between a landlord and a tenant. It sets out certain obligations of each party and also acts as evidence, in case any dispute arises regarding the property. This lease deed format can be used by the owner of the property for the leasing of commercial property to the lessee. The agreement is duly signed by both the parties to accept the terms and conditions framed in it. It is an authoritative document having the power of law which might be referenced by courts in case of a difference. 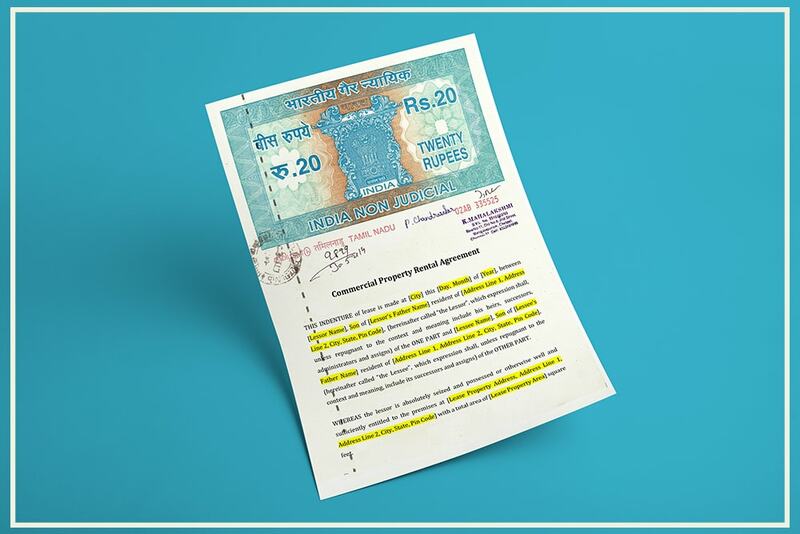 The lease deed must be imprinted on a Non-Judicial Stamp Paper. The estimation of the non-legal stamp paper or stamp obligation payable on the agreement made would rely upon the State and the estimation of the rent payable according to the lease agreement. Lease deeds can likewise be registered at a Sub-Registrar Office having purview over the premises to be leased. Two duplicates of the rent deed are normally created, and both the parties will have one copy of it. A lease agreement or a rental agreement is an essential legal document that should be accomplished earlier to a landlord renting property to a tenant. While both the agreements are comparable in nature, they are not the same and it is imperative to comprehend the distinctions. In light of the term and period of the agreement, the legal documentation made can be named as a lease deed or rental agreement. Both agreements are dealt with distinctively under the Laws in compelling in India. Lease deeds are the contract between a landlord and a tenant for renting out of the property for more than 12 months or maybe more than that. Lease deeds have to stand for by firm rent control laws that are most favorable to the tenants. The length of the lease and the monthly rent amount are once documented and cannot be changed. This guarantees the landowner can't subjectively simply raise the lease and the occupant can't simply leave the property at whatever point they need without repercussion. Further, rental control laws right now keep the proprietors from cheating the inhabitants and shield the occupants from sudden or unjustifiable eviction. Additionally, the right to ownership of the property gets transferred from the landlords to the tenants in case of the lease agreement, making it harder for the landowner to vacate his property. Henceforth, most proprietors don't like to go into registered lease deeds that are more than a year. Rental agreements are made for a period of 11 months, with an alternative to re-establish the understanding at the lapse of the agreement. As a rental agreement that is 11 months long is just a legal permission for the tenant to live in the premises for a short duration, rent control laws do not make any difference. Further, rental agreements that are 11 months long permit the owner to take more measures in case of vacating the rented property. Hence, most landlords in India prefer to have a rental agreement that is only 11 months. They have the choice to renew agreement once the previous one is completed. The landlord can change the terms and conditions of the rental agreement but before giving prior notice to the tenant.